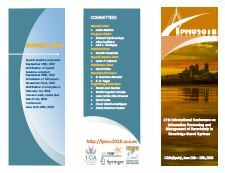 IPMU 2018 invites to submit previously unpublished research advances of theoretical and methodological nature as well as application-oriented work. The submissions cannot be under review or accepted for publication in a journal or another conference. Contributions will be selected upon their quality evaluated by at least three reviewers. Proposals for special sessions are welcome to be considered by the program committee. Theory, Methods and Tools: Uncertainty, Bayesian and Probabilistic Methods, Information Theory, Measures of Information and Uncertainty, Evidence and Possibility Theory, Utility Theory, Fuzzy Sets and Fuzzy Logic, Rough Sets, Multiple Criteria Decision Methods, Aggregation Methods, Knowledge Representation, Approximate Reasoning, Non-classical Logics, Default Reasoning, Belief Revision, Argumentation, Ontologies, Uncertainty in Cognition, Graphical Models, Knowledge Acquisition, Machine Learning, Evolutionary Computation, Neural Networks, Data Analysis. Application Fields: Intelligent Systems and Information Processing, Decision Support, Database and Information Systems, Information Retrieval and Fusion, Image Processing, Multi-Media, Agents, Pattern Recognition, Medicine and Bioinformatics, Finance, Software Engineering, Industrial Engineering. The submission must be written in English using the Springer style (LNCS/CCIS one-column page format) (http://www.springer.com/computer/lncs/lncs+authors?SGWID=0-40209-0-0-0). 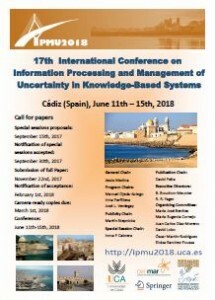 In the system you can choose one of the proposed special sessions or the general track of IPMU2018. One full registration will allow acceptance of one paper; each additional accepted paper associated with the same registration will be subject to an additional fee. The conference proceedings will be published in Communications in Computer and Information Science (CCIS) with Springer. CCIS is abstracted/indexed in DBLP, Google Scholar, EI-Compendex, Mathematical Reviews, SCImago, Scopus. CCIS volumes will also be submitted for the inclusion in ISI Proceedings (Web-of-Science). .- Springer’s templates should be used. Either Word or LaTeX templates are acceptable. .- If available, please include the authors ORCID number (www.orcid.org) in the address information and in the paper’s headers. .- Authors are advised not to shorten the references and to put DOIs wherever possible, as this would allow for correct citation attribution. .- All source files (LaTeX files with all the associated style files, special fonts and eps files, or Word files) AND the final pdf AND the Consent to Publish form should be compressed and uploaded as a single zip file. For Latex users, references are to be supplied as bbl files or included in the .tex file instead of the bib file, in order to avoid omission of data while conversion from bib to bbl. .- Please do not forget to allot a corresponding author, who must be available to carry out a proof check of the paper. The corresponding author is given 72 hours to check the paper.